Among those prospective employers this year were two alumni who had been on the other side of that table. Tucked on a corner table, a tri-fold display accompanied by pamphlets and brochures of Monocacy National Battlefield was centered between two FSU graduates, Travis Baker ’00 and Brian Dankmeyer ’14. Frostburg alumni do find themselves running into other Bobcats in the break room at work, but for Baker and Dankmeyer, their shared passion for the outdoors and national parks placed them on the same historical battlefield. 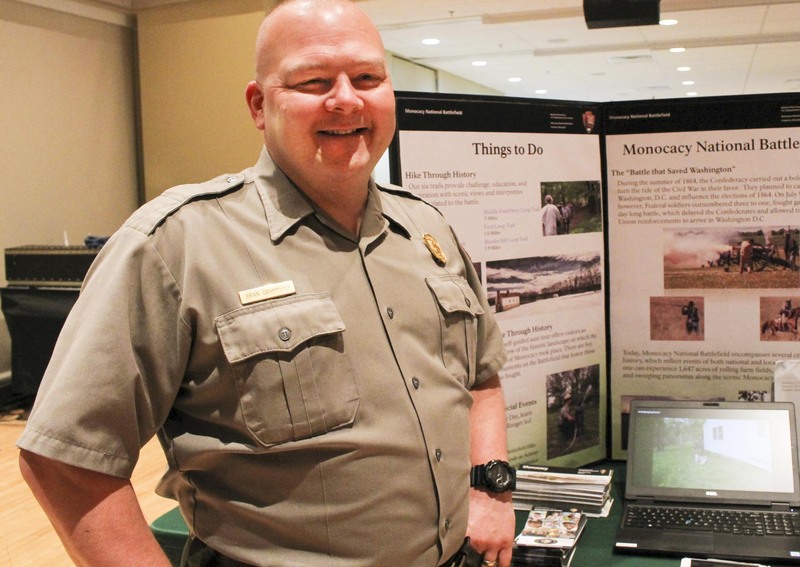 While Dankmeyer and Baker share the same recreation and parks management major, as well as a work place, their path to Monocacy Battlefield had some variations. Baker “grew up in the woods” and enjoyed nature to the fullest extent. He wanted a job that would allow him to stay immersed in his wooded surroundings. Frostburg’s proximity to the great outdoors and to his home were more than enough selling points for him when he was considering colleges. Dankmeyer majored in FSU’s nationally accredited Recreation and Parks Management program, and graduated in 2014. Frostburg is one of 71 schools accredited by the National Recreation and Parks Association, one of Dankmeyer’s main reasons for choosing FSU. 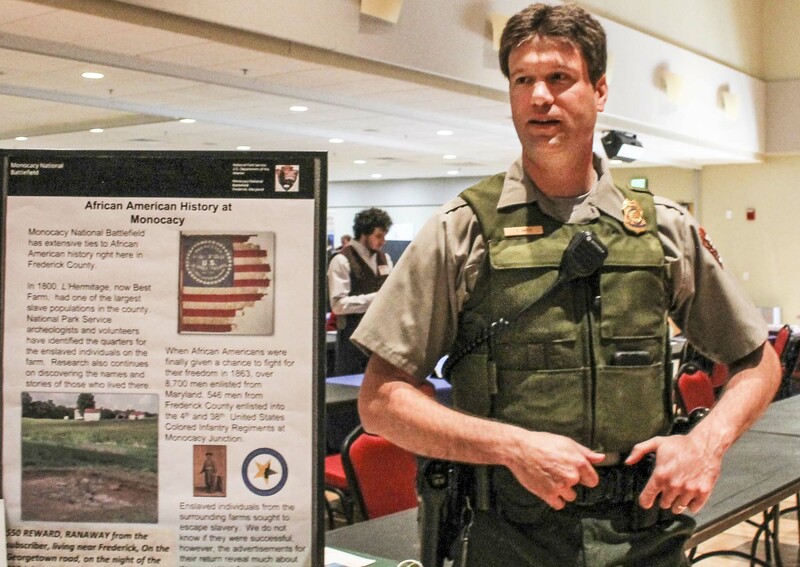 In his position at Monocacy Battlefield, his mission is to “educate visitors and students on the resources of the park,” as well as explain its importance. “I started volunteering with the federal government at Antietam National Battlefield when I was 13 years old,” Dankmeyer said. His passion began while he was young. Starting with volunteering where he could, Dankmeyer made plans to land his dream job, and it did not come quickly, taking about eight years to make the transition and working in several parks. During his time at FSU, Baker obtained a job at a nearby national park where he did maintenance, worked on the trails and eventually did some work in biology. In 2000, he graduated and by then had transitioned to park law enforcement, a position he currently holds. “I eventually went to law enforcement and then became permanent and I’ve been here ever since,” Baker said. The experience that Baker and Dankmeyer shared at FSU gave them instruction needed to guide them through the work force. Some of the event-planning exposure given to them as students helped them prepare for events like the Career and Internship Fair, whereas other classes showed them how interact with diverse groups of people. “Not everybody who comes to your park is there for the exact same reason. You have a very short window of time to figure out how you can provide services to an individual,” Dankmeyer said. Baker’s role in law enforcement at Monocacy expands beyond the park itself. As a member of law enforcement for a state park, Baker is also a part of the U.S. Interior Department, meaning if more help is needed in the event of a natural disaster or major law enforcement events, he could be sent out to assist. This wide job description is one of Baker’s favorite parts about his job. A favorite for Dankmeyer is the constant interaction with people. “I like to serve people, I love the subject I’m dealing with and I like to share my passion with other people,” Dankmeyer said. Not everyone ends up at their dream job, but to be there and find common ground with a fellow graduate is a bonus. Do you work with a group of Bobcats? Let us know at alumni@frostburg.edu.